DUO is a workbench from Grangier Constructeur for electrical cabinet and low voltage switchboards, consisting of a multifunctional punch-and-bend table, allowing quick and easy work on rigid or flexible copper and aluminium bars. DUO is available in standard version for busbars up to 125x10 mm; sturdy and removable casters are provided to make the workstation mobile. 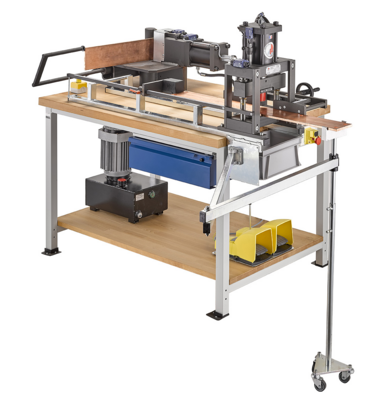 For busbars up to 200x10 mm, a heavy-duty DUO workbench is also available. The end-stops and holders integrated into the workbench facilitate the installation and manipulation of the bars; the folding head and the cutting / punching machine each have their own footswitch up/down. It takes 10 seconds to mount lasting and robust set of cutting blade or tooling laminated / flexible bar. Wrench or screwdriver isn’t required. Punches have a retractable centre pin which facilitates drilling following a path. Punches are available from Ø5 to Ø18 sizes, and oblong 7x16 to 13x16. The bending machine has a large platform with etched angle line 15/30/45/60/90 degrees and an electric and adjustable stop.